All in all, 2017 has been a pretty INCREDIBLE year here. I’m sat writing this retrospective post a few days before NYE in a place that quite frankly I never thought I’d be sitting in a year ago: my office and pretty much second home: the BBC newsroom. 2017’s been an interesting year: I graduated with a solid master’s degree that my heart wasn’t really in. I can’t tell you how glad I was to be done with the world of education after 17 years of school and university. In the end, my passion for academia went from being a labour of love to something of a chore I wasn’t inspired by. Nonetheless, that chapter of my life is now well and truly closed (at least for the time being). But it feels great to say: I DID IT! As one door closes, another opens… Or so the saying goes. That has most definitely been very true in my case. 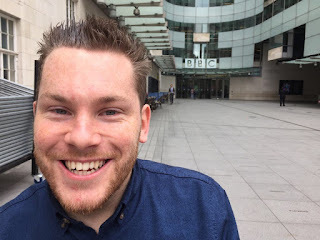 In October, I started my dream job as a journalist on the online international desk at BBC News. I must admit: I have to pinch myself every day as I walk into the newsroom as it still doesn’t feel quite real. So far, I’ve worked on dozens of stories, written a few features, and covered a fair few live events - from snow in the UK to the Catalan elections the week before Christmas. I’m not going to pretend that it hasn’t at times been a learning curve, but I’m LOVING every second. I moved into my own parcel of London at the end of November – sure, it wasn’t easy to find somewhere that was accessible and suitable, but I finally feel that my new flat is becoming a wee home. I’m loving every second of London life: the opportunities, the food, the coffee (of course), and the wonderful people I’ve met. It feels like every year that I write this, but: I wouldn’t be able to be the person I am without the support of my wonderful folks, Bo and Rob. THANK YOU from the bottom of my heart for never letting me give up – even when that means forcing me to get on a plane to Barcelona when I wasn’t feeling it - and encouraging me to be the best version of myself every single day. Well, here’s to 2018 and, if it follows on from how 2017 has ended, it should be set to be a good one.